This is only Mach3 related in so far as the software Gearotic Motion has been written by Art Fenerty (the writer of Mach3) and supported by an extremely active forum in much the same way as Mach3. 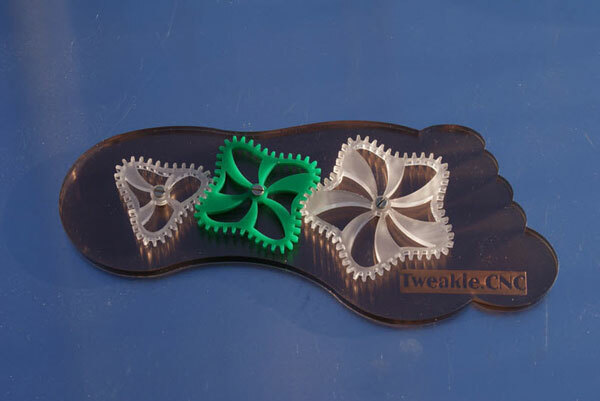 As well as serious stuff, this software also allows for the design of non-linear gears and I just had to laser cut some of these from acrylic. GM outputs GCode (as well as .dxf) and these gears really do mesh perfectly – so far I have not actually tried a conventional spur gear but I am sure it will be just perfect. Wooden Gears for Wooden Clocks perhaps ?? These are both free to use (I like free software) and output HPGL or .dxf files as appropriate. The LazyCam program (included with Mach3) will open the files and create the necessary GCode toolpaths for production. There are also a number of free HPGL to GCode converter programs around which could also be used. Although Gearotic does not mention the capability, if you use the profile between a pair of their gear teeth, you obtain a perfect profile of a single tooth gear cutter for that gear. If you cut gears in the conventional manner, with an A-Axis rotating the gear blank, this cutter profile, ground or cut into a single-point tool and used like a fly-cutter, will cut a more perfect gear than one cut with a commercial gear cutting tool. Cheaper too. Thanks Mike, another very useful suggestion indeed. Incidentally, since Art has now acquired an RF laser Gearotic Motion appears to be taking on a whole lot of new functions, perhaps aimed primarily at Mach4 usage but interesting none the less.